Hello. I haven't been with you for at least 4 months. But I thought that i should update this site at least once in a season. I took time to expand and update the manga section. I prepared a new review of my recent purchases. Do check it. Apart from this the summer is notable for two major events for me. The first one is JLPT test. This spring I applied for Level 2 and took the test on July 3rd, the birthday of Tomochin and Maasa. I prepared for it as best I could but there were still some words I didn't know so I'm not sure about some answers I gave at all. But we'll see. The results of the test should be sent to me by mail at the end of September. I'll let you know if I passed. The second event is an interview for Tokyo Terebi. Now I tell you the story. It all started with a call from a Japanese lady, Rei-san, who presented herself as a manager from Tokyo TV. That is, I'm now sort of considered a rep of AKB fanclub here so I was contacted first. I was asked to come for an interview and bring a few friends along to form a crowd. Which I subsequently did. - AKB album "Koko ni ita koto" with a fantastic hardcover photobook inside. - Tomochin's single "Fui ni"
- Yukirin's (French kiss) single "Kakko warui I love you"
- And the photobook that I talk about in manga section. The interview was very short, around 7 minutes but I didn't miss a chance to speak some Japanese. It eased the interpreter's work a lot. - How did you learn about AKB? - I saw them completely by chance. I watched some anime broadcast and then a program called AKBINGO started. I was absolutely charmed by the girls' beauty. It happened around 2 (actually 3, as I figured later) years ago. How long do you learn Japanese? - Around 5 years ago. Actually I'm self-taught. What I've learned so far is all thanks to AKB programs and DVDs. - And do you know who's no.1 in AKB? - It's Acchan. - And do you get the results of sembatsu soon? - Yep, we monitor it. By the way, one of my friends learned about AKB from me and went right to Tokyo to watch their concert at Akihabara. - Would you like to visit Tokyo, too? - Oh, yes! - And what would you like to see there? - Well, must-see places (midokoro). I haven't been to Japan but I'm saving money for the trip. To end the interview we shouted the first lines of "Aitakatta". After the interview the emcees went outside the cafe to finish filming the report. Obviously there were a lot of those who wanted to be shot together with Ayako-san and Okuni-san. And I took my chance to take Hatta-san's autograph. "Sumimasen. Ano...Hatta-san... sain shite itadakemasenka?" The message was understood. Also, note the roadworks at the back. Ayako-san gets a bar of chocolate for her hard work. And I hope the program about Russia goes on air. For now a site is opened: http://www.russia-japan.jp/ But it only says there are lectures about Russia and Japan organized by TV Tokyo and led by the announcers. I'll monitor the situation. It's been hundreds of years since I updated this site last time. I'm becoming (why becoming? I simply am) worse than Kipi-san who once left her blog for one year but lately she's doing her best to post updates regularly. This is something to be proud of. I can't be as responsible. More than that, I even ignored such important events as AKB concert in Moscow last fall, the New Year or the terrible earthquake that hit Japan on March, 11, 2011. Well, actually I didn't ignore the events themselves but honestly I was too busy to didn't feel motivated to write about them. Speaking of AKB concert, the Japanese TV actually made a footage of it. The journalists even bothered to interview several fans from "AKB cheering squad". Then the materials were turned into a 1 hour long AKB Moscow Documentary program. I translated it into English and uploaded the video for you to watch. You can read the translation and find links for the video if you click right here. Then, you have most likely heard that Japan was hit by a strong earthquake and it's still in mess. Though things are getting better and the business operates as usual. My friends are OK, too. What is worse I now took great interest in Hello!Project (aka Haropro) and artists who belong to Up-Front Agecy in general in addition to my obsession over AKB. You can say that Haropro partially replaced AKB but that's not quite true. I still watch AKB programs as well. Lastly, what made me write this text is a new package that has just arrived from the islands. Yes, I'm doing online shopping again. For this reason, I've updated the usual place where I write about my purchases. And of course this time I coudln't do without Haropro stuff. But I suggest you check the actual page to know the details. Have a nice time. I hope that my review will at least partially answer you questions as to what I got and why I needed it. By the way, I keep forgetting to inform you that I finally changed my ADSL ISP to a cable internet provider. Now it's up to 100mbs both ways but I chose a budget tariff with a speed of 20mbs but turns quite cheaply to me. In contrast, 100mbs tariffs are priced at some astronomical levels so I decided I'd pass this time. But still it's a huge gain in upload speed compared to ADSL. Hope to get come up with an update sometime again. As promised, I'm here with you again and I have great news. My first packaged arrived from Japan safely. Everything's in perfect order. But this package is the one I call a "study pack" and "entertainment pack" is yet to arrive. Still, I should say that tenso.com works wonderfully. I was able to collect several Japanese textbooks from different shops and they carefully packed all my parcels into one package. Besides, thanks to the fact that they send packages with EMS I had absolutely no problems with the customs. Please follow this link to know the rest of the story. I'm here again and I'm truly sorry that I've almost dropped this site. And it's sad that we got fewer and fewer occasions to meet. Same thing for my penpal. We're not dead but a total lack of activity here makes you think otherwise. Still, a few days ago I actually fixed a few broken links on the music page. The server was out of use and my files got deleted but everything's back online again. And why am I here, all of a sudden, you might ask? The thing is today is my birthday so I felt like I need to do something nice and this something should mean at least updating my poor site. I've brought two cans of Coca-Cola too, to celebrate the occasion. Cheers! AKB49 � manga Chapters 1 to 3. Apart from this, I'm planning to order a package from Amazon.jp with various staff including manga, audio CD and magazines. I hope it arrives safely and I'll have a good reason to prepare a decent update for this page. But what I have to say is that starting from September I have a few projects which are extremely time-consuming. First, I'm back to studies and I'm trying to pursue the damn degree again. Though now I think that it's almost impossible to come up with something adequate I have no other choice but to continue my efforts. The second project is Japanese studies. So far I was completely self-sufficient in my studies but I decided to make it more effective so I'm pursuing a course of Japanese. The classes are twice a week and I obviously have a bunch of homework. Still I hope we'll meet again in the near future to talk about my recent shopping. My best wishes to everyone. Take care! Hello, everyone. It's summer time! I'm happy to greet you on this page. In fact, there's nothing new on my side. I'm on vacations since last year and I spend my time on entertainment. But still, there's one thing that I wanted to talk about. Or perhaps two things. First, on May, 9 I attended the parade dedicated to the victory over Nazi in 1945. There were helis, airplanes and ground weaponry including tanks, artillery and Kuzma's mother. The photo report can be found here. Then, the last week of May was memorable for a spectacular event in Moscow. And that is World Team Table Tennis Championship. I attended the quarterfinals and I should say that I was deeply impressed and I was happy beyond any measure. My emotions were so big that I typed the whole 10 pages of text which I'm going to share with you on a separate page called Table Tennis. Once again, thank you for tuning in. It's May, 5! We have Iori's birthday! Yay! If you're wondering whether I'm still alive or not then I assure you I am. But the schedule doesn't really let me write every so often. Well, if you remember Kipi then missing for a year would be a usual thing. Another reason for choosing not to write is a complete lack of new purchases. Because reading messages like "I slept till 2 p.m. then made some Japanese translations" is apparently dull. That's why I avoid doing so. Still, now that I'm here I do have to say that I'm into my Japanese studies and I'm advancing with my new textbook. Going back to purchases I have to tell you that I've cut my expenditures to a complete zero because I'm saving money for a trip. What I did when I was missing is translating Ayumu's story in Time Leap game (420 pages). also I got back to playing/translating Dream Club. And I'm not telling you that I got a thing for AKB48 because it's a pretty time-consuming addiction. Assuming the number of TV shows they appear in and the concerts they give, checking even a small portion of them inevitably results in wasting a couple of hours every evening. Well I guess that it's about all for now. I'm very much obliged to you for your continuous visits. Thank you very much for your support. Hello. Finally I'm making one more update. My CD called "RH Singles &・・・" arrived back on Jan., 20. I was very slow to scan the booklets and upload the mp3 version of this disc but it's finally here. I added comments to Manga page one and the CD itself, at least in it's digital form can be found at music page 6. As promised, I expand Manga page one. This time I add the report on the package I got on Monday (and ordered back in December 2009). I'm sorry I didn't update the page earlier but it's all because of my attachment to Xbox. Also, there's a delay in shipment of my second package. Actually it's stuck at the customs. They really try my patience because this package was supposed to arrive around the time of the first package. Hello again. As promised, I made an effort to change the copyright mark and the navigation menu on every single page of the site. When I started to open the pages I was simply terrified with what I saw. Many pages were dated by 2008. I tried to label everything properly and I hope this update will make navigation easier for you. I also made some minor changes along the way. Namely, I updated my contact info removing an old email address and adding some new options instead. Once again, I remind you that I expect some new merchandise to arrive and I'll be sure to share my impressions and pictures here. Hello! Happy late New Year! I'm very sorry for the total lack of updates. And I'm truly grateful to you for your patience and continuous visits despite the pitiful state of my site. This year it'll be 5 years since I started this page and I'll have to put some effort to clean up this mess. I'm starting to change the labels and outdated links so hopefully you'll see updated pages in the near future. What I've been busy with for the last few months is translation of im@s and Dream C Club. The work is still in progress and honestly, there's much more text than I can possibly translate alone. Still, it's worth a try and I really enjoy the process. The second important issue is upgrading my hardware. Since I got my Xbox I came to realize that my audio devices are in terrible state and I don't have any HDTV facilities either. The only thing I had was a 8-year-old Sony CRT display which basically produced a terrible picture. As for the audio I only had my AKG headphones which are not quite usable with Xbox if attached to it directly. - NEC MutliSync LCD 2490WUXi2. A detailed review of this equipment can be found at manga page one. And as if this alone weren't enough I'm waiting for two new packages from Honk Kong to arrive in the following days so please expect even more updates from me. Stay tuned and happy holidays if you have any. Hello and sorry for the late update. In fact I have great news because I finally got my Japanese Xbox 360! But I got it back on November, 5th so I could tell you about it much earlier. I didn't because I got seriously addicted to Dream Club and as a result, I can't find any spare minute to write my impressions here. Again, I'm updating the manga section, page 2 and 3. News photos and comments can be found at the bottom of the page. Thank you for your patience and your continuous moral support. More info can be found on the updated page of manga section. Also, I noticed some broken links in the navigation menu. I hope that I managed to fix some of the most noticeable script errors. I have a birthday. I'm 25 now. That means 1/4 of a century. I think that's quite a lot. And if I made it this far (some of my friends have already gone) I hope I'll keep on going just as good as I did before. And of course, if you have booze, use it! I already had some wine (Bordeaux, AOC). So, cheers! Kampai! Hello again. I promised to update the site as soon as I receive more packages. Му order with play-asia.com was actually split in two parts. Today I received the first part of it and the second package is on its way to Moscow. Once again, the transaction went very smoothly. 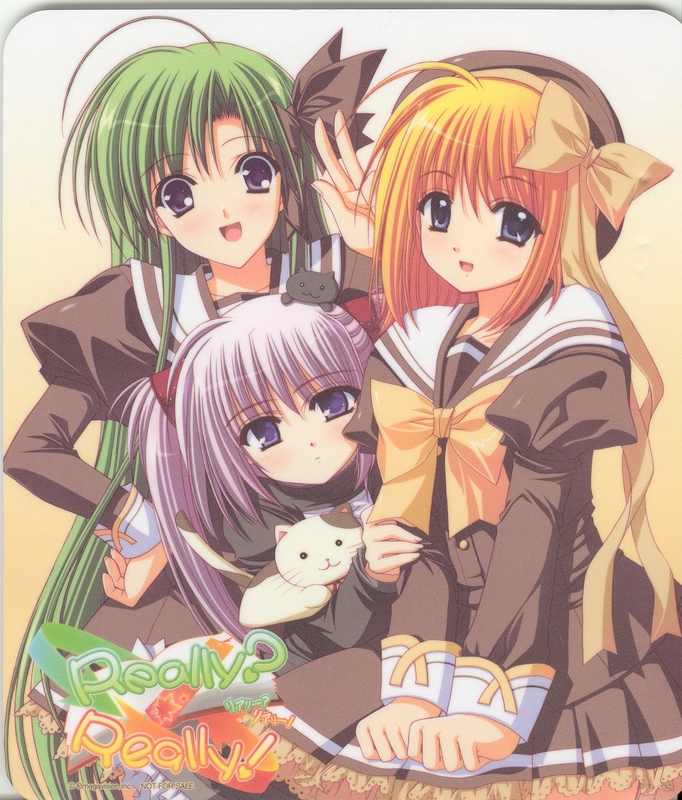 The package I've just opened contains Dream C Club, a game for the Xbox 360 console. And yes, I don't have an Xbox but still felt like getting this game. I'm using EMS this time. I should say that this delivery service is rather fast. As a part of state post it benefits from tax exemptions. If it weren't for the customs clearance procedures I could receive my packages in as few as 3 days. But in addition to the time EMS makes its job to deliver the package to me there's a long delay at the customs office. So this time I received my package in seven days. This means that the situation got worse compared to what was before. I remember that back at the time when I ordered my first Japanese game, and that was Sakura Taisen, I got it in 5 days. Now it takes longer to go through the customs but at least I don't have to pay any extra fees. The scans and photos are here at this page, following my recent manga list. Also I'm opening a separate page for Dream C Club game. Hello. It looks like it's been two months since my last update here. Well, everything's fine so far. I'm staying home and I'm playing Haruka game excessively. The thing why I remembered I have this site is actually a good occasion. I've been thinking to buy some Japanese stuff right since my last order and I finally made a hard decision to spend some funds for manga. So, last week I placed an order with amazon.co.jp and the package is already here. I remember the trouble I had last time when I ordered expensive textbooks, so this time I kept my expenses as low as possible. As a result, the transaction went very very smoothly. Nobody worried me with calls and the delivery was pretty quick assuming the place where I live and where Japan is. So it seems that the customs agents do pay a lot of attention to the price and volume of imported goods. Back then, even when I exceeded the cap of duty-free imports the only thing that was needed was a copy of id docs to make sure I received the items for personal use. Now nobody cares about the use, the agents only care about imposing taxes. Anyway, here's the list of the items I got. And I have already prepared a description and scans in large amounts here. There will be one more package this month, so please stay tuned for more updates from me. It appears that my update corresponds with the US bombings of Japan. All due respect, but they didn't have to burn people in stoves to begin with. So, the first one is 翼をくださいfrom けいおん. The second is a new song called 'made in WONDER' that I got attached to. Once again, Josh was very kind to make the scores for me. The song is actually the ending theme for the anime よくわかる現代魔法. I should say that I came across the series completely by chance but found it very likable. I've made scans and mp3 versions of the CDs from the package (see below). You can now find them in the music section, page 5. Uh, the lack of updates, sad news about people passing away...I'm of the impression this place starts to look like a graveyard. I think I'll have to change the design to bring back some positive vibes to my site. I'm personally doing more or less OK at the moment. Still, by the looks of it I'll have to leave you for quite a while again but I'll make sure to let you know about any important events here at my side. I have good news, too. The weather is fine here in Moscow these days. It looks like it's finally summer here though we're basically in the middle of it now. I missed a lot of things including July, 4th, Tanabata, and July, 14th. Though, speaking of July 14th, some of French guys actually had their own approach to celebrating it by burning cars on the streets. IMO, it wasn't the greatest idea. Since the time of my last update I finally finished playing KimiKiss game (キミキス), completing 'nakayoshi' routes for Asuka, Narumi, and Mao-neechan. Asuka has some of the best episodes in the game with the participation of Futami-san (they had a fight, actually). I've prepared a translation of this half-secret scene along with screenshots so you can take a look at it if you missed while playing on your own. Speaking of translations, I should say that I came up with a new approach to playing Japanese games I have for my PS2. Now I started to keep notes of all the dialogues with a full translation of episodes that I find particularly interesting. It's very time-consuming but the good point of it is that I check for all the unknown words in the process. Obviously, that way I have a higher chance to put more new words to memory. Unfortunately, most of the translated materials are in Russian and I have to back-translate them into English for you to read it here. After finishing Kimikiss I went straight to playing Haruka game (that is, 乃木坂春香の秘密 こすぷれ、はじめました). I thought that it's like a now or never chance for me to try it. The game has been laying in the drawer all this the since last November. This anime turned out to be pretty nice and it's absolutely worth including it to the show list on the right of the page. I also finished watching Candy boy. And speaking of the summer anime season, I started to watch Princess lover! Of course it's not the best anime which is based on a PC game but the two episodes I've watched so far were quite enjoyable. Also, I'm happy to announce that I'm back to shopping after almost a year-long break. I placed an order with Amazon.jp last week and now I put my hands on the package. This time it's not very large but I still managed to exceed the limit for duty-free imports, so they charged me around $140 in taxes and brokerage fees above the payment for the order itself. Still, it's always a pleasure to buy something new. The first three positions are textbooks (two textbooks, one dictionary, to be exact) for my Japanese studies, and anything below that is pure entertainment. To my regret, I couldn't fit everything I wanted to buy in one package. Say, there are several new volumes of Tsubasa manga available but I had to put them aside for new. 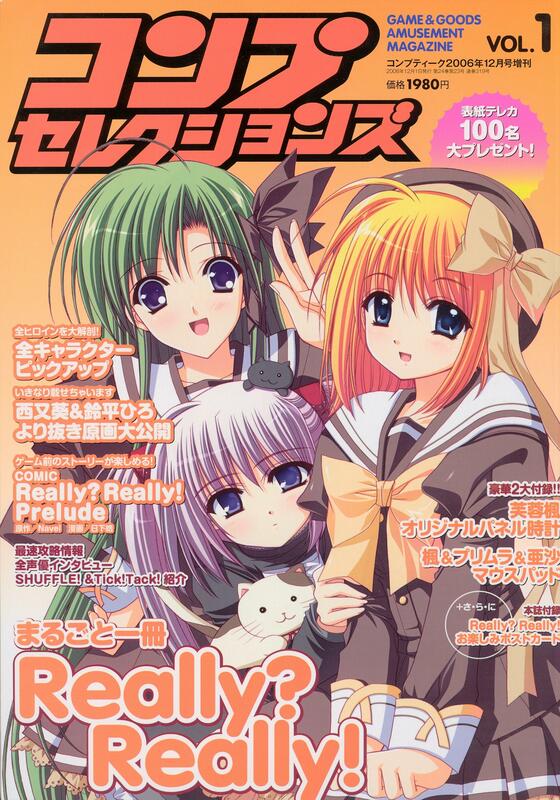 I'll be updating the site now, so you can be sure you'll find the scans of the goods under the traditional manga section (aka Manga, Magazines&Stuff). I've come up with a hardware upgrade as well. No, my PCs are the same as last year. What I'm speaking about is a new microphone I got quite recently. You might have noticed that there's a collection of piano music here at this site. All of the recordings were made using some terrible equipment including my handheld device or a 15 years-old Panasonic microphone. So I finally went to the music store. There's a story related to the store I visited. The shop is actually some 15 minutes of walk from my home. And it's been there for years. I remember, back at school I went there with my groupmates to play the piano (we preferred a digital (electronic) piano which cost some 25k dollars back then). But I haven't stopped by it since then. Now the store takes two floors. The first floor is occupied entirely by an array of pianos and grand pianos. On the second floor you can find all kind of equipment and supplies, electric and digital instruments. And I quickly found a section with microphones and headphones. So I got this one � AKG D77 S. It was the cheapest model I could find there but it looks good despite the fact that it costs around $70. And it comes with an XLR cord, mind it. I got 2 additional connectors to attach it to my PC. It resulted in a chain XLR-line-minijack. Now you can start asking me why I didn't get a simple xlr-minijack cord. Actually I think that instead of those adapters or cords it needs an amplifier to get a good result but to my regret, an amplifier is beyond my budget. A photo of the mike is here, in the manga section. All of the new recordings will be uploaded to the music section. I'd also like to mention that Mr. Josh helped me once again with piano arrangements. This time I received 3 pieces for Really?Really! OST. I've already tried to play 'Lucky Attack', it turns out quite alright. But to my regret, I can't do without numerous bad fingers. Now, before I forget. We're close to the end of July and I'd like to remind you that you have a chance to watch Sumidagawa Fireworks Festival (隅田川花火大会) on TV. This year it'll take place on July, 25th from 7:00 pm to 8:54 pm local time, and will be broadcast live on TV Tokyo. I'm sorry if it happens to be early in the morning at your place but everyone else should be okay. Please refer to the TV Tokyo official site (http://www.tv-tokyo.co.jp/) for more information on the event. Stay tuned for more news from me. Once again, let me thank everyone who visits this page despite the total lack of updates. Hello, everyone. Thanks to all for worrying about my health. I'm happy to let you know that I'm safe at home. My health condition may not be perfect at the moment but I'm quite able to use my PC at least. I've just happened to type a lengthy post so I decided to move most of the older new to the archive page. No text is going to be deleted. My eye surgery went smoothly. Though honestly the first week after the operation I was feeling quite bad. I was suffering from nausea and a high temperature. But I was treated extensively. But I was sent home 2 days after I was done. I.e. the surgery was on Tuesday (April 7) and I was already home on Thursday. I'm an outpatient now and I visit my eye-doctor once a week. I'm prescribed lots of eye drops and the recovery will take at least 2 months. Please mind that the operation doesn't solve my eye sight problems. I have a complicated case and I'll need additional treatment in the near future. So that'll probably take a lot of time and effort from my part to achieve an acceptable result. OK if you want to hear the story then here it is. I had perfect eyesight in the childhood but at around the age of 8 I was hit in the right eye with a sharp object. The eye was badly damaged, I had a surgery and they had to remove the lens. And I had 2 more operations afterwards because of complications. So I've been using contacts for around 15 years. But I consulted my doctor lately saying that I'm starting to get increasingly short-sighted and I'm a bit squint. They suggested getting a lens implant. So I agreed to be operated on. Now it's like a welcome to cyberpunk for me. As if it weren't enough I have astigmatism on the right eye because of the trauma and numerous operations. The result is a very low eyesight. Now I'm prescribed some special glasses to wear for around 3 to 6 months to be able to see close to normal. They also help to concentrate on objects (the glasses are basically minus 0.5 and minus 1.5 with some features but work wonders � I tried a test set). And my order seems to be late due to May holidays. It appears that I'll have to wait for about 3 weeks to get them. But after that I'll need laser surgery to finally get my eyes working without any glasses. And of course I hope I'll be able to see like a normal person. The only sad fact is that the medicine is not perfect and the doctors say the result can be from 70 to 90% for my right eye. The treatment takes lots of time, too. So you can see that having a trauma can result in big problems for a large part in your life. Also, sad news came from fellow visitors of minitokyo.net. It's the site where I have several very nice penpals and I found out about it long before I started the site project and joined animesuki. So it appears that the guy who helped me building my webpage passed away earlier this year. Just like that, he got sick, got to hospital, got to ICU and kicked the bucked soon after. It sounds terrible to say the least. I personally still get shivers. The information came from several sources and it appears to be true. And who could think that it would turn out like that. Last time I felt something like this was when I finished school and my classmate died soon after getting her certificate. She lived near my house. Last time I saw her alive was the summer before I started to prepare for my entrance exams to the uni. I met her at a local grocery, we chatted happily about plans for future and a month later I saw her in a coffin. There were only 2 students in the whole class who got all A's in our certificates, me and her. I'm the one survived. Those are all horrible things and the worse of it all is that it's all for real, not the movies. So every time something like that happens you start to think more about yourself. Now I'm typing a message to you, then I do some translation and then what if I�m not able to do anything anymore. Nobody would even know this happened. Well, there's room for optimism because I don't feel like kicking the bucket in the near future. Even though my eyesight may not be perfect my general health is good enough (though I�m not sure about my heart, oh). Obviously, under such circumstances my translation projects have to be put off. Despite the difficulties I try to find time to sort out the anime stuff I got earlier.So, I'm getting back to reading manga and I try to finish the scenarios from Kimikiss. Making an in-depth analysis will most likely be difficult for me but at least I'll know what it is all about. It appears that this year it'll be the 3rd anniversary for Kimikiss and I'm looking forward to getting Amagami, not forgetting about Haruka, of course. Now, in the absence of new projects I've brushed up a few pages by adding some explanatory notes as well as links to official sites any my English translations which I hope will be of some interest to you. Notably, pages dedicated to Fortune Arterial and Navel/Lime wait for you to take a look at them. Thanks again for your continuous visits. OK, I missed Haruka's birthday. It was on April, 3rd. Meanwhile I won't be able to come online in the near future. It was decided that I actually get an eye surgery, so I'm going to hospital on Monday. I think that during the weekend I'll manage to upload the materials which have been stored on my PC for quite some time now. I'm sorry that I couldn't upload them earlier but it always comes to the fact that you're busy with several projects and you always have to choose between them. I can say that the manga section is updated at last. It's only that I reserved a few black pages and it looks a bit messy. 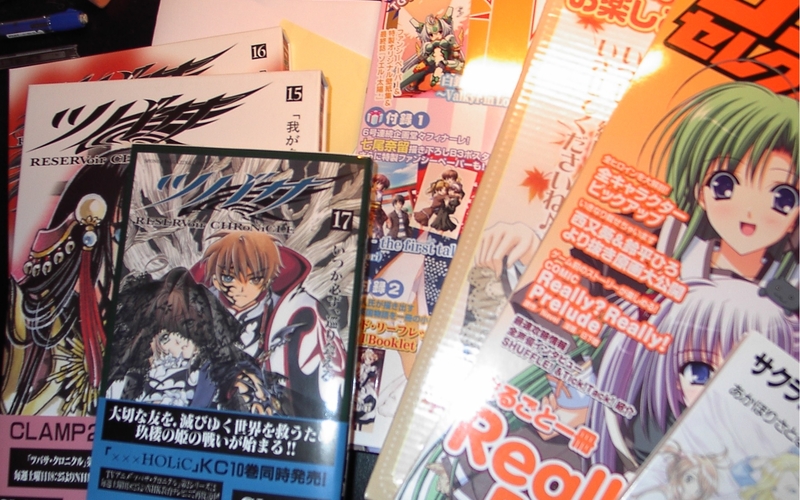 More than that, the contents of the package from Hong Kong have nothing to do with manga but at least I planned this update back in 2008 and it's finally here. Chihaya is Kisaragi Chihaya, that it. If you're into iDOLM@STER thing, let's eat some cake or have a drink or something for the occasion. Thought I only have soda at the moment. Anyways I remembered iDOLM@STER because I'm working on the translation of extra DVD for Idolm@ster Live for You! game that was released last year, on Feb., 29. Somebody actually released fansubs back then but the quality of translation was so low, to the point that it put me into thinking this special episode deserved a better fate. The problem is, my ISP messed up with my request to connect me by ADSL 2+ and I've been waiting for more than a week now for my connection to be restored. I'm forced to use my cellphone as a bluetooth modem to keep track of things. I'm using my 2G Sony Ericsson S500i for that. The result is almost like you're back in good old days of using a 56k modem. Plus you get exorbitant bills for use of traffic. So, this connection cut-off delays me from uploading video. I also need to find people to help me with translation.